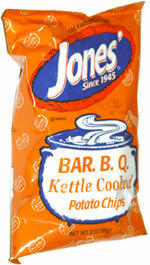 Taste test: These are very crunchy barbecue chips with a nice barbecue taste and a mildly hot aftertaste. Pretty good. Smell test: Kind of greasy.